This week's Tuesdays with Dorie (TWD) recipe was chosen by Becky of Project Domestication: Burnt Sugar Ice Cream. I had already made this recipe a few years ago, so if you'd like to hear my thoughts about it (I loved it), you can read my post here. What I bring to you today, though, is a recipe that would pair wonderfully with the burnt sugar ice cream. A few weeks ago, a friend of mine was making some caramel apple oatmeal cookies from Cooking Light. I asked her for the recipe, and when she gave it to me she warned me that the dough came out really dry and crumbly. So, before setting out to make them, I read through the reviews on the website to see if this was a common problem and to check for any solutions. Indeed, it seemed like the vast majority of bakers found the dough too dry to work with. There were a few people who added an extra tablespoon or two of butter, but it didn't seem like there was any foolproof fix for this. These turned out quite well if I do say so myself :) They are definitely much better the next day after the flavors have had a chance to meld. I had a bite fresh out of the oven and was a little disappointed, but when I went to have another bar the next day, I loved them! Although this recipe is loosely adapted from Cooking Light, it's about as close as I ever get to making my own recipe, so I hope you'll give this one a try and let me know how you like it! Melt 1.5 tablespoons of butter in a large nonstick skillet over medium-high heat. When the foam subsides, toss the diced apples in and cook, turning once, until they are golden brown, about 3 minutes. Sprinkle the apples with 1 teaspoon of cinnamon and 1 tablespoon of brown sugar and cook them, turning, just until coated, another minute or so. Transfer the apples to a small bowl and let cool while you make the cookie dough. In a small bowl, sift together the flour, baking soda, 1 teaspoon of cinnamon, and salt. In a large mixing bowl, beat the butter and sugars until light and fluffy, about 2-3 minutes. Add the eggs, one at a time, mixing well between each addition. Add the vanilla. Turn the mixer down to low and add the dry ingredients, mixing just until they are incorporated. Stir in the oats, caramel bits, and apples. Mix well. Let cool completely before cutting into bars. These taste best when wrapped well and served the following day. You guys are all killing me with all these awesome desserts! They look SO good! Ooh, those look really good and do sound perfect for the burnt sugar ice cream! 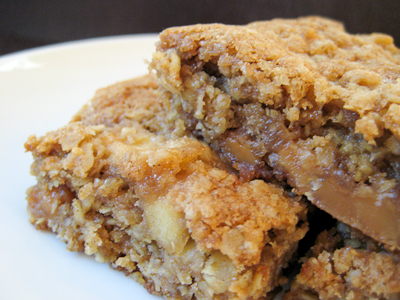 Just the name caramel apple oatmeal bars got my attention. Then when I saw the mouth watering photos and your recipe I knew I was in love. These look so good and I love your twist in making the recipe better and to fit your needs! Thank you, these are going on my list to Must Bake! It looks like it was a good thing when your baby started to cry because I think these cookies look fabulous as bars! ohhhh my goodness, this looks and sounds delicious. i'm definitely going to have to give these a try. 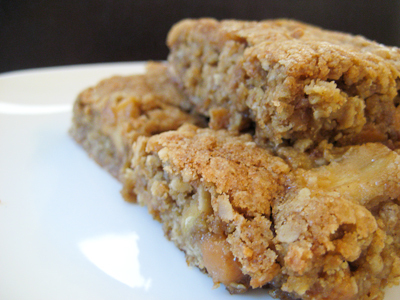 Oh wow caramel apple and oatmeal all in a chewy bar, these sound like my idea of heaven!! 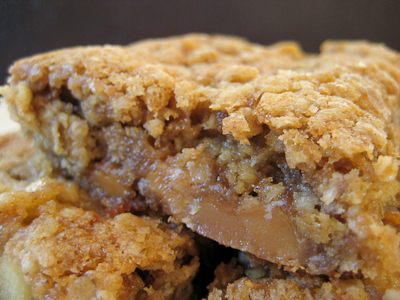 bars > cookies, caramelized apples > dried apples. this is a stellar creation, jaime, and it'd indeed be the perfect compliment to some of that ice cream! Oh my goodnes, those sound sooooooooo good!! I was attracted by your scrumptious looking dessert. I know of Dorie...however, I don't have her book. Therefore, thank you for sharing this recipe. Squee! I just got a blog shoutout! Hello Jaime...I first want to thank you for stopping by and to thank you for your clarification. You were right. I had two windows opened simultaneously...and one of them had the burnt sugar ice cream...for which I had made a note to try soon. Btw, Hope you have a marvelous Mother's Day!! These sound delicious, Jaime. And I consider yours to be an original. After all, all recipes for a particulat thing start off with the same basic ingredients and ratios! Anything with caramel has my attention. These bars look divine! Oh wow, these look amazing! I love caramel and apples together! These look delicious! I would like a plate of them right now as a matter of fact! YUUUUUUUUUUM!! I'm bookmarking these immediately! Very rich and delicious. 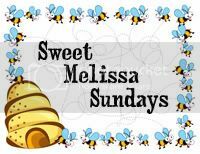 Did not add the caramels, because I made the recipe as stated then made a warm homemade caramel sauce to pour over the top. Quite decadent! Would be fantastic with a plain vanilla ice cream. Fit a small, heavy-duty saucepan with a candy thermometer, then add the water, butter, granulated sugar, and brown sugar, mixing them together. Have the baking soda and vanilla measured and ready. Cook the mixture over medium heat, stirring as little as possible. When the mixture reaches 300 degrees, remove the pan from the heat and immediately stir in the baking soda and vanilla. Mix just until combined; don’t overstir. Right away, pour the hot toffee mixture on to the baking sheet. Using as little movement as possible, spread the toffee into a thin layer. Cool completely, then remove the toffee from the baking sheet and break the toffee up into bits using a kitchen mallet or a rolling pin.